On this mountain the Lord of hosts will prepare a feast of rich food for all peoples, a banquet of wine on the lees--the richest of foods and the finest of wines. On this mountain he will destroy the shroud that enfolds all peoples, the sheet that covers all nations; he will swallow up death forever. The Lord God will wipe away the tears from all faces, and will remove the disgrace of his people from all the earth. The Lord has spoken. In that day they will say, "Surely this is our God; we have waited for him, and he saved us. This is the Lord, we have waited for him; let us rejoice and be glad in his salvation." [At dinner] Jesus said to his host, "When you give a luncheon or dinner, do not invite your friends, your brothers or relatives, or your rich neighbors; if you do, they may invite you back and so you will be repaid. But when you give a banquet, invite the poor, the crippled, the lame, and the blind, and you will be blessed. Although they cannot repay you, you will be repaid at the resurrection of the righteous." "Then the master told his servant, 'Go out to the roads and country lanes and make them come in, so that my house will be full. I tell you, not one of those people who were invited will get a taste of my banquet.'" Once again, our traditional time of feasting has arrived. In a few days, most, if not all of us will be sitting around the Thanksgiving table with family and friends, enjoying the richness of the harvest season, and the richness of our relationships with one another. By now, I suppose that those of you who are hosting Thanksgiving dinners have already invited your guests, who, in turn, have already responded as to whether they'll be there or not. Now imagine that Thanksgiving day has come, the dinner is prepared and ready, and none of the people who told you they would be there show up. Instead of the doorbell ringing, the phone starts ringing with one person after another giving some lame excuse for not being there. Naturally, after putting all that work into preparing a real feast, you'd be rather annoyed, if not downright angry! Perhaps the members of your household would sit down and eat as much as you could, and make the best of it. Then you'd set about the task of putting all that leftover food into the refrigerator, knowing you'd have food for the next week! Of course, in the times of Jesus there was no such thing as a refrigerator. Yes, there were methods of storing food. But once a meal had been cooked, for the most part anything that didn't get eaten right away had to be thrown away. Perhaps this was one of the reasons that it was the custom in those days, after all the invited guests had had their fill, to invite anyone who happened to be in the neighborhood to come in and eat what was left. Naturally, any poor folk or beggars who caught wind that a feast was happening would be waiting in the wings! Once a food was put on the table, it was not taken off, and all who wanted could come and eat until all the food was gone. Notice that in the story from the Gospel of Luke, when the owner of the house told the servant to bring in the poor, the crippled, the blind, and the lame, his servant replied that this had already been done--just as custom would have demanded. In effect, everyone who wanted to come was eventually invited to the feast. The honor was to be among the first guests invited. To the wealthy, well-educated people at the Pharisee's house where Jesus was having dinner that day, the idea that the poor, the crippled, the blind, and the lame would be invited to partake in the feast was nothing unusual. The barb in the story was that the specially invited guests, who were presumably of the better classes, had no part in the feast, while the people of the despised lower classes were given the honor of being seated first, and tasting the rich food and fine wine fresh out of the kitchen. And the kicker was that it was the invited guests' own fault that they missed the pleasure and the honor. They were invited to come, but they all made rather flimsy excuses for not being there. Of course, the Scribes and Pharisees who were at dinner that day knew that Jesus was talking about them. They knew that they themselves were the "rich neighbors" whom Jesus was inviting to the spiritual feast, but who did not want to come. And they knew that the despised tax collectors and sinners that Jesus spent much of his time with were the "poor, the crippled, the blind, and the lame" who were partaking in that feast instead of them. But they did not feel any regret about missing out on the feast. Rather, they felt anger that this rough, unschooled Galilean presumed to lecture them about religion. So they made various flimsy excuses as to why they could not and would not listen to him. You would think that anyone would want to come to a great feast and enjoy the food, rather than going out and looking at a field, or working with some oxen. Of course, being a newlywed might be enough to keep some people away. But why not bring the new bride along?! Still, people make excuses. In our house, sometimes when the call goes out, "Supper's ready!" the response is not always immediate. I must confess that if I'm in the middle of some project up in my study, it sometimes takes me a while to make it down to supper. Sometimes the kids don't feel like coming to the table. Usually they'll say, "I'm busy building a tower!" or something like that. But another effective excuse is, "I'm not hungry!" Sometimes that's true, because they've been snacking all afternoon. Other times, though, "I'm not hungry" means the same as "I'm busy," namely, they're more interested in whatever they're doing at the moment than they are in eating. Of course, Jesus wasn't really talking about food and feasting at all. He was talking about the rich feast of spiritual food and drink to which the Lord is continually inviting us. In the same way that our body needs food and drink to survive, our minds, our emotions, our souls need spiritual nourishment in order to live and thrive. We need the good food of love and kindness shared with one another, and the fine wine of spiritual insight and understanding flowing into our minds. Without these things, our inner being begins to starve. Our life becomes a dry and empty affair, focused only on making our living and getting a bit of pleasure here and there, with nothing deeper to inspire us or call us forward to greater and deeper things. The three excuses that the invited guests gave can be translated into the same excuses that we tend to make as to why we can't answer the Lord's invitation to pursue a more loving and spiritual way of living. The first one said he had just bought a field, and had to go see it. There is not such a big jump from this to the fields of human knowledge and learning. If we're too busy with our own theories about life and with the practical and scientific knowledge of our culture, we'll never sit down at the feast of deeper, spiritual knowledge. The second one said he had just bought five yoke of oxen, and wanted to go try them out. Presumably this man was a farmer, and he'd be using the oxen to plow his fields. Just so, we may allow our day-to-day work and occupation to so consume our lives that we tell ourselves there just isn't time to do the church thing. "I'll do it later, when I have more time." If we think of these excuses as coming one after another in our own minds, the third excuse is a warning against taking this path. First, we say we have no mental energy left for learning the spiritual knowledge offered by the Lord and the church. Then we say we have no physical energy, because we're too busy with all the tasks of our everyday lives. Finally, we say, "I have just gotten married, so I can't come." By the time we get that far, we're already "married" to our own unspiritual way of life, and we have no intention of breaking out of our habits to answer God's call. The barb that Jesus hid in this story may apply to us, too. And it's not just about whether or not we attend church. It's about whether we accept God's call to broaden and deepen our thinking beyond the usual, well-worn attitudes and platitudes offered to us by our culture. It's about whether we accept God's invitation to rise above our own feelings, wants, needs, and emotional hungers in order to learn what it means to truly love the people around us, and to love God. On the practical level, it's about whether we are willing to put our devotion to the truth and to doing what is right first--ahead of our reputation, our job security, and even the support of our family and friends if that should conflict with doing the right thing. It's about whether we're willing to risk everything we have and everything we are in order to live a life devoted to both truth and compassion. God's invitation is open to all. But we risk a lot if we accept the invitation--especially if we think we already have it made. Notice that it was those who could afford to buy a field, or buy five pairs of oxen, or have a fancy wedding that excused themselves. We are the "rich neighbors" when we think that our lives are already good enough. If we think that we don't need to learn anything more or live in any better way than we do now, then like my boys when they're too busy playing with their toys, we're just not hungry for the spiritual feast that God is inviting us to. If we're already full of our own intelligence and of this world's cares and pleasures, there is no more room in our stomachs for God's food and drink. 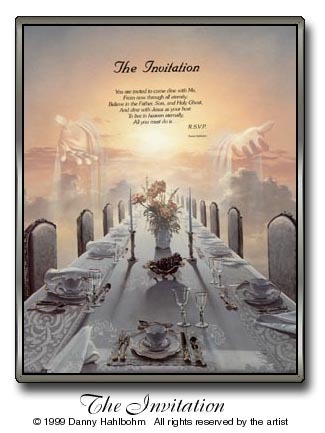 Notice that it was the poor, the crippled, the blind, and the lame who did respond to the invitation, and came immediately to sit down and enjoy the feast. In another place, Jesus said, "Blessed are the poor in spirit, for theirs is the kingdom of heaven. Blessed are those who mourn, for they will be comforted. Blessed are the meek, for they will inherit the earth. Blessed are those who hunger and thirst after righteousness, for they will be filled." (Matthew 5:3-6). When we realize that we are spiritually poor, crippled, blind, and lame, then we are truly hungry for God's feast. When we realize that something is missing from our life; that we are hurting; that we just don't understand; that we can't go on this way any longer, then we are ready to accept God's open invitation. The spiritual feast is prepared and ready. God has sent an invitation to you, to me, to every person in this community, to every person in the world. It is a sumptuous feast, offering the richest of foods and the finest of drinks. God is offering us the rich food of real love and compassion. God is offering us the fine wine of deep spiritual insight that can satisfy even our most difficult of our questions. It is all spread out before us, ready and waiting. Now it is up to each one of us to accept the invitation, come to the feast, and join our extended spiritual family in the ongoing spiritual Thanksgiving dinner. Amen.